Italy was beautiful but hot. So much history. It would take a long time to properly explore everything Italy has to offer. DAY SEVEN: Drove to Pisa and took cliche pictures by the leaning tower. I had no idea the leaning tower was not the only building in the town square, but merely the bell tower to the cathedral and baptism chamber that stand alongside the tower. Online you usually only see photographs of the leaning tower. The weather was around 39 degrees so the pool at the hostel in Florence was well utilised. DAY EIGHT: A lot of time was spent on my own two feet today, starting with a walking tour of Florence. As with most cities on our stop there is a beautiful church and plenty of stories to go with the various bridges, statues and buildings. We went to a leather factory to see some examples of products made in Italy as leather work is one of the traditional industries. On the coach and of to Rome where we launched straight into the second walking tour of the day taking in most of the major central monuments including the Colosseum. Once we finally reached the accommodation it was around 9pm and I was absolutely exhausted. 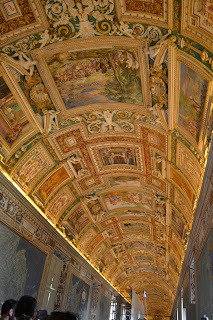 DAY NINE: The Vatican City tour was good but not great. The ceiling art and buildings were amazing, but the number of people and the seemingly disinterested guide put a bit of a dampener on the entire experience. After the tour we proceeded to the Colosseum where we had a guided tour amidst the thunder storm. I had anticipated to building to be more intact and require a bit less imagination to picture it as it once was, but it was incredible nonetheless. The city view from the top of the Victor Emmanuel Monument were really amazing. That being said, the actual building stands out from the surrounding monuments for all the wrong reasons. It almost seems too new and white for Rome. Back at the hostel things kicked off a little thanks to 5 euro bottles of wine at the "Beauty and the Geeks" themed party. DAY TEN: Back on the bus and on route to Venice, via Verona. Romeo and Juliet supposedly lived in Verona and Juliet's balcony is a popular spot for people looking for an extra bit of luck in love. At the Venice hostel the pool was awesome, but as soon as the pool party was over we were straight to bed for an early night. DAY ELEVEN: Venice streets are ridiculously narrow, winding and confusing. Not to mention packed with tourists. Felix took us on a walking tour taking in yet another cathedral. We then went to demonstrations for both glass blowing and lace making. When in Venice one must always ride a gondola, which is exactly what we did. After getting a little bit lost in the city we headed back off the island to the hostel for a swim. In the evening we had a masquerade party.